Supernova (def. ): Explosive death of a star, caused by the sudden onset of nuclear burning in a white dwarf star, or gravitational collapse of the core of massive star followed by a shock wave that disrupts the star. 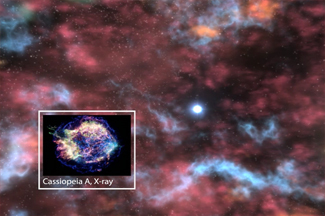 When a star blows apart in a supernova, the explosion creates a remnant of multi-million degree gas that shines brightly in X-rays for thousands of years. Every 50 years or so, a massive star in our galaxy blows itself apart in a supernova. Explore the approximate positions and names of historical supernovas in the Milky Way in this simple Flash map. This interactive guide illustrates the ongoing drama of stellar evolution, and how the rate of evolution and the ultimate fate of a star depends on its mass. A Flash piece looking at some of our favorite Chandra images of supernova remnants.